I can’t believe it’s cauliflower! So recall my image from kitchen experiments? 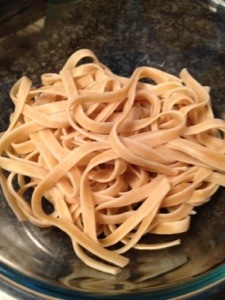 Well, all those ingredients went into making cauliflower fettuccine. As in, I made pasta sauce out of cauliflower. 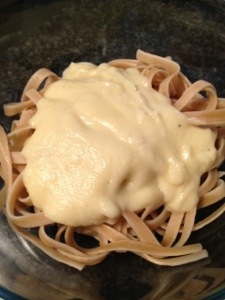 Clearly cauliflower is still my vegetable du jour, so how excited was I to try my hand at using it to make a sauce. It’s better than a ton of cream and cheese. 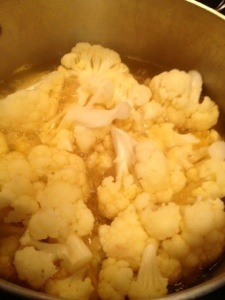 So I began with my cauliflower, washed and cut up. Into a pot of boiling vegetable broth until soft. About 15 – 20 minutes. As this boiled, I sautéed some garlic in a little olive oil and set aside. 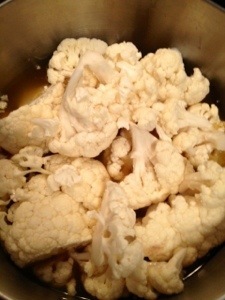 By now the cauliflower is ready to be turned into sauce. 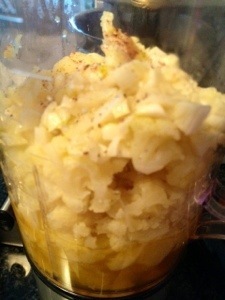 All the cauliflower went into the blender along with about 3 cups of the broth. I also added the garlic, some black pepper, salt, olive oil and a pinch of pumpkin spice (yes pumpkin spice. I didn’t have nutmeg, this was the next best thing on hand). Did you know nutmeg goes well with cauliflower? 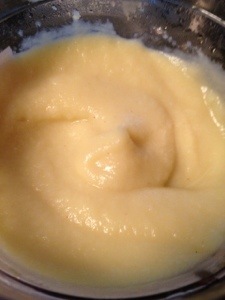 The purée is then put back into a saucepan and a little bit of milk is added. 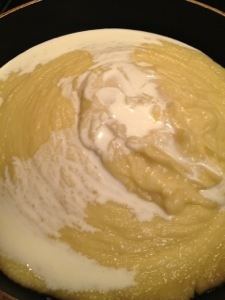 You could use cream or even omit completely. As I found out, it just helps to thicken the sauce but really does nothing for flavour. The sauce sat warming and thickening as I cooked my noodles and contemplated cleaning up my kitchen. If there’s one thing about this recipe, it’s that you will be using quite a few pots and utensils to cook it up. Or maybe it’s just me, when I’m in the kitchen, it sometimes looks like a hurricane pulled through. 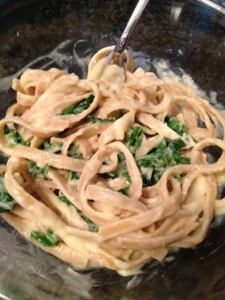 I always like to add a little something extra when I make pasta be it some meat like chicken or some sort of vegetable. 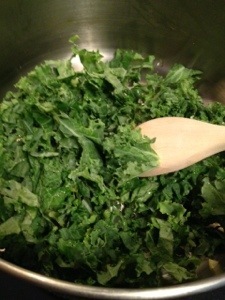 I went with vegetable this time and one I have never cooked or eaten before – kale. Related to the cabbage family kale is very high in beta carotene, vitamin K, vitamin C, lutein, zeaxanthin, and rich in calcium. 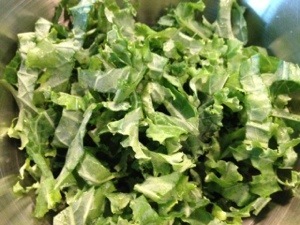 Kale, contains sulforaphane (particularly when chopped or minced), a chemical with potent anti-cancer properties. It is also a source of indole-3-carbinol, a chemical which boosts DNA repair in cells and appears to block the growth of cancer cells. (Thanks Wikipedia lol). In any case, I thought I would try it out. I took off the stems and rolled up the leaves so I could cut them chiffonade (into ribbons). 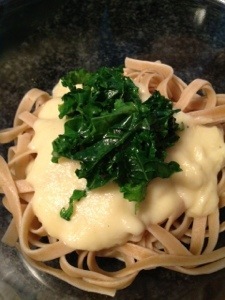 I quickly sautéed the kale with olive oil, garlic and a little bit of the remaining vegetable broth from earlier. Just until they reduce down a bit and are tender. I am in LOVE with this sauce. It was so creamy smooth and rich and savoury. I truly believe if someone gave me this and did not tell me it was cauliflower, I would never know the difference. It was creamy and rich. 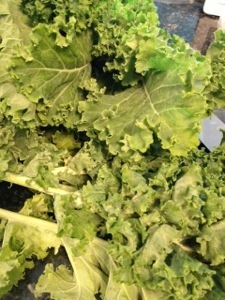 The kale added some great contrast in both colour, taste and texture. A little “crunchy” and a little bitter, it was perfect. But one could use any vegetable here, maybe mushrooms or broccoli instead. The possibilities are endless with this sauce. Definitely a “must make again” dish. 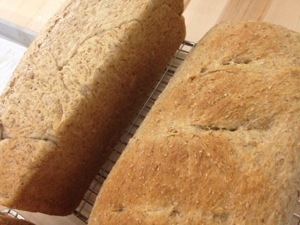 So this week brings us some practice at making whole wheat and 6 grain bread. My table full of ingredients. 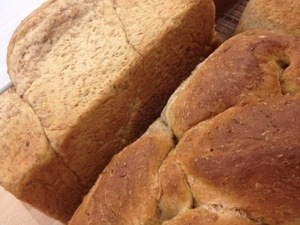 We are at the point now where we start off the same – make a yeast slurry, throw in all the ingredients and mix in the mixer with the dough hook until the bread pulls clean from the sides. 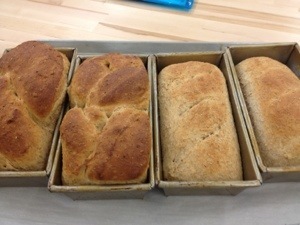 After left to proof, into the loaf pans they go to proof some more. I’m seriously not in the mood to be creative. 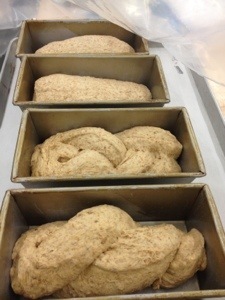 Here are my loaves piping hot and on racks to cool. Whole Wheat Shortbread Cookies? Sure, why not?! My Aunt asked if I could make shortbread. I said I didn’t know, but I’d try. Thought I had all-purpose flour on hand. I didn’t. 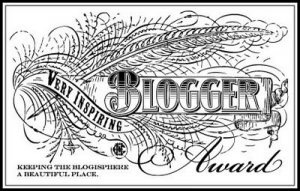 (blasphemy! and I call myself a baker!) 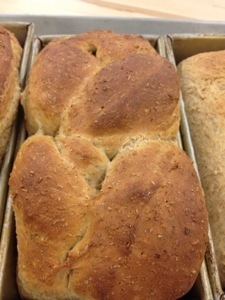 I had 4 bags of whole wheat flour. 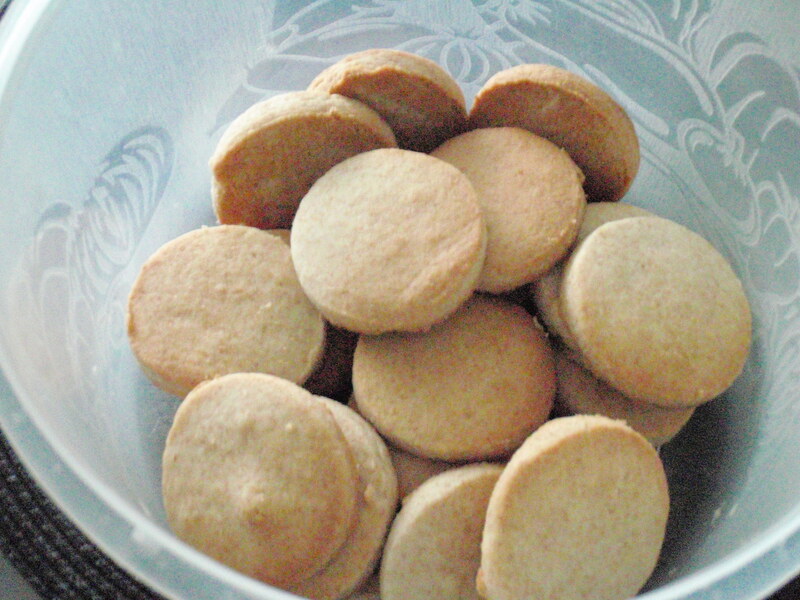 Whole Wheat Shortbread Cookies? Sure, why not?! 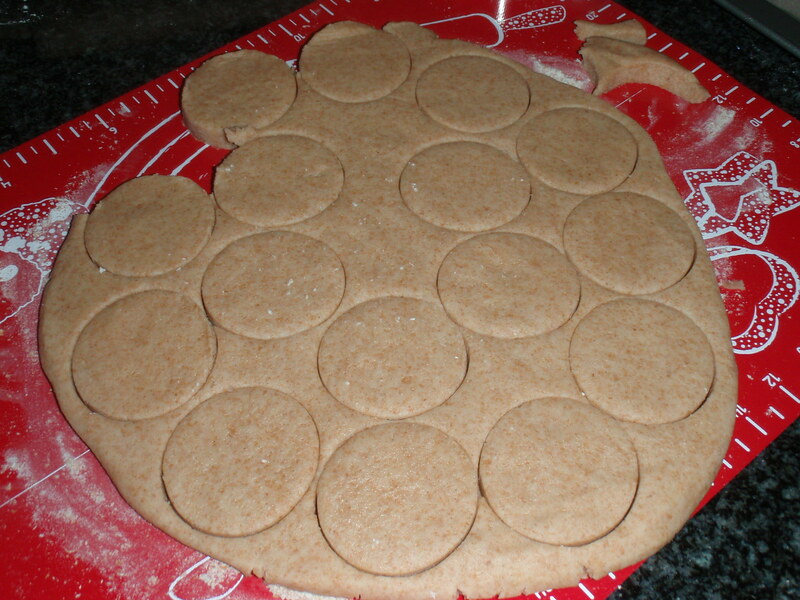 Dough rolled out and cut using a round cookie cutter.